For developments coming in, we (like everyone else) require traffic studies to be performed for impacts related to streets, traffic and circulation. One of the ideas we are toying with is requiring those studies to have an element of bike/ped data baked in. So we have a more well-rounded answer on why we want this data, I'm curious if your municipality also asks for bike/ped data when traffic studies are required? If you need do ask for this data, what are your primary reasons? This is one of the key areas of improvement for many of our communities. There are so many reasons to reform Transportation Impact Analyses. It shouldn't just be done for development projects either, it should be more inclusive of all capital projects (ideally). The first reason is to improve the analyses is to address the safety performance of our streets using proven countermeasures for reducing risk for people walking and improving access to transit. The second reason is to implement long range mode split goals into our forecasting of transportation demand. In Portland, ideally a new development would be producing 25% bicycle mode split for commute trips. Once you state that as a goal, it makes the agency consider whether the adjacent street should provide a protected bicycle lane adjacent to the development. If the mode split is 8% for people walking to work and 15% for transit, the preparation of the traffic study should complete trip assignment that identifies the paths of the people walking to the development. That necessitates the analysis of intersections to determine whether crossing improvements (beacons, medians, etc) are necessary to insure safe facilities. Most of us know how the provision of additional travel lanes for automobiles makes intersections wider and potentially more dangerous for people crossing. So, another recommendation is to inquire whether the City is willing to consider a lower Level of Service (LOS) during the peak hour. In addition, the analysis completed as a part of the Highway Capacity Manual, actually considers the peak 15-minute of traffic flow, so one simple recommendation is to consider eliminating the use of the peak hour factor to reduce the extent that traffic analyses are focused on the worst 15 minutes of the entire day. Truly designing for the 1%! As for the data for walking and cycling, many good traffic counting firms already provide the data in their turning movement counts. If they don't, you should specifically request this in your traffic impact study requirements documentation. Once you have this data, an agency could easily do some modification to the Highway Capacity Manual to estimate delay for people walking and cycling. If an agency requires the traffic impact study to conduct an analysis of intersections adjacent to the development to determine whether an enhanced pedestrian crossing is recommended it could be useful. The other thing that you could require is aggregating person delay from the Highway Capacity Manual methodologies. By incorporating the delay calculations for the various HCM methodologies (pedestrian, vehicle, bikes (with modification), and transit), is a concept worth considering. Person delay is a weighted average that utilizes the traditional LOS analysis and other modified HCM procedures to assess walking, cycling, and transit delays. The number of people on the bus would increase the importance of that particular approach to the resulting measure. 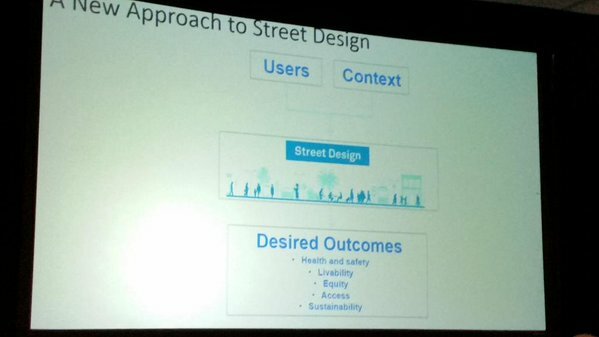 It can be useful when using existing data, reflecting the people that are using the street currently and for future considerations. The various results from the different modes are aggregated to discern the overall person delay for each signalized intersection. The future considerations would require assumptions of mode split by the local agency, but this would be consistent with the recommendations contained in the City Planning documentation. A Protected Intersection in San Jose is defined as a local intersection for which no further physical improvement is planned. The City declares that these specific intersections, because of the presence of substantial/potential transit improvements, adjacent private development, or a combination of both circumstances will not be modified to accommodate additional traffic and operate at a Level of Service (LOS) D or better. If a proposed development project would cause a significant LOS impact at one or more of the listed Protected Intersections, the proposed development will include construction of specific improvements to other segments of the citywide transportation system, in order to improve system capacity and/or enhance non-auto travel modes. The City of San Francisco used intersection LOS as the primary metric to evaluate the performance of roadways until 2016. At that time, the city sought to use a process that better aligned with its existing policies aimed at encouraging more transit use and improving the bicycle and pedestrian systems. After a detailed analysis, the City settled on VMT per capita as a metric to assess the impacts of new development. This new metric encourages development in transit-rich areas and supports higher densities that encourages multimodal tripmaking. The City of Fort Collins, CO has redefined Level of Service standards for multimodal transportation for use in their community. It is effective because it provides quantitative measures for walking, cycling, and public transit. The City developed these standards because "applying LOS standards to specific sidewalks, for example, would ignore the issue of whether the sidewalk in question is connected to the rest of the pedestrian network". The Fort Collins Multimodal Level of Service Manual establishes standards for each mode, recognizing that "When LOS for automobile mobility falls below identified levels, mitigation will be required to ensure a high degree of accessibility is provided through alternative modes". The Portland State University Study Abroad program visited the City of Delft today. Our host was Jan Nederveen, who visited Portland and Boston a few months prior to our visit. 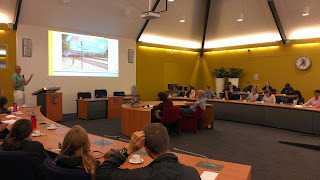 The presentation he gave focused on the planning of Delft and how they have approached the challenge of getting people to cycle more. Traffic signals and intersections are designed specifically for cyclists. The transportation analysis showed with these categories determined that cycling was a good way to increase the air quality. They have done a lot with cycling, but it's not the entire story. Transit is a big part of their work becuase many people are commuting to TU Delft from significant distances, the City has also invested quite a bit on transit planning. The presentation describes their investment in rail which has been centered on the main train station which is at significant cost. There has been limited work on the connections to the bus network. The bus provides some connections for people that can not cycle. One of the massive initiatives in Delft to help them realize their goals was undergrounding the railroad that divided the main center from a significant neighborhood to the west. The largest impact of the rail corridor (200 trains per day) was the noise of the trains crossing near the homes in the area and its impact to the community. The City recently completed the railroad tunnel that provided 4 tracks and is 2.3 km long. It provides an amazing boost to the nearby neighborhood adjacent to the station. Two tracks are operational now, but an additional two tracks are being dug out so that there won't be a need to come back later to address capacity needs between The Hague and Rotterdam. 1 Billion Euros was the overall cost of the project. 80 Million Euros were contributed by the local agency (Gemeennte Delft). The financing for the project was established because they are in the process of building 10,000 houses as a part of the project on the land that is reclaimed as a part of the railroad tunnel. Unfortunately for Delft, the housing crisis hit at the wrong time for the community and as the market returned the project has suffered from delays in the finance plan coming to fruition. Ultimately, the investment is worth the costs, because of the alternative of not building would result greater societal costs. The project also included a high capacity bike facility separate from the other modes and bike parking facilities. In 2007, the bike parking was overloaded, even though there were 6,000 spaces. In 2016, the completed project added 2,700 parking spaces with a bike garage of 5,000 spaces! The Delft station and an adjacent parcel that will be redeveloped in the coming years as a "Student Hotel" for students that are staying for four weeks (or something like that) and there's another plan for the Delft City office buildings were opened a few weeks after our opening. Hey kids, let's go to the 5,000 space bike parking garage on vacation! It was another successful year in collaborating with professionals involved in research or applications that are worthy of presenting at the annual Transportation Research Board meeting. Paulsen, Kirk, William Farley, Todd Mobley, Michael Ard and Peter Koonce, “Analysis of Active Warning Sign to Address Potential Bicycle "Right-Hook" Conflict at Signalized Intersections”. Moore, Adam, Peter Koonce, Paul Zebell, and Jon Meusch, “Timing Issues for Traffic Signals Interconnected with Highway-Railroad Grade Crossings”. Sobie, Christopher, Edward Smaglik, Anuj Sharma, Andy Kading, Sirisha Kothuri, Peter Koonce, “Managing User Delay with a Focus on Pedestrian Operations”. Boudart, Jesse, Nick Foster, and Peter Koonce, “Improving Bicycle Detection Pavement Marking Symbols to Increase Comprehension at Traffic Signals”. The list for 2015 is here and a link to my post-TRB letter to the Committee on Traffic Signal Systems. The TRB Annual Meeting is one of the most wonky times of the year. NACTO held its annual conference in Austin, TX. Austin is a good city with the potential to be great. 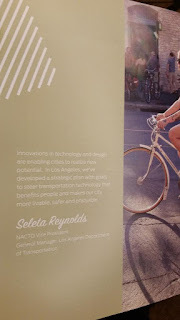 The National Association of City Transportation Officials meeting was a great chance to learn about updates from many of the NACTO member cities and industry leaders. Austin has spent a lot of effort making connections for multimodal travel in the past 10 years. The meeting set a record for attendance (650!) and included many of the leading voices in multimodal transportation. I spent a lot of time with notes on Twitter, so if you want to review more you can look back in my timeline. I find Twitter useful for sharing and learning more about what others are thinking. In fact, I learned about "The New Social Learning" this past week. NACTO offers a chance for cities to share ideas. These include big picture policy ideas and design details such as what an engineer needs to know to get a facility built. The Commissioner panel and keynote speeches were fantastic for providing the big picture guidance. Janette Sadik-Khan kicked off the conference with a keynote on advancing transportation policies and a preview of the Global Street Design Guide, NACTO's latest project. This latest initiative will incorporate guidance from the Urban Bikeway Design Guide, Urban Street Design Guide, and other documents into a document that represents international best practices. The most interesting concept from the preview included an emphasis on desired outcomes such as health and safety with a focus on users and context. Great quote from LADOT GM. The presentation was followed by a pecha kucha session that included former APBP Board Member Seleta Reynolds who is General Manager of LADOT, Robin Hutchinson, who the Director of Salt Lake City Transportation, and Ryan Russo, Deputy Commissioner of NYCDOT. The pecha kucha session challenges presenters to offer quick thoughts in a fast paced way that keeps attention of the audience. It's something that I hope to see more of in the future because of the excitement created by the quick pace. One of the best parts of most conferences are the technical tours in cities that afford an opportunity to learn about the implementation of innovative projects from the practitioners responsible for the project. 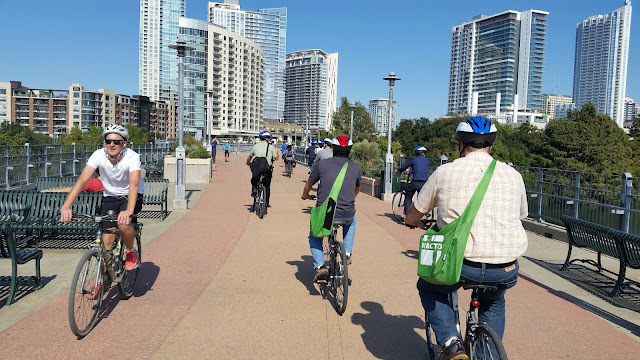 In Austin, we had a chance to visit their downtown protected bike lanes, the City's Traffic Signal Shop and Operations Center, and many other facilities. The City of Austin have completed some fantastic projects that are advancing walking and cycling in a traditionally car oriented community. The protected bike lanes on the ground in Austin have evolved since my last visit to Austin, two and a half years ago. During that visit, I learned about the detector confirmation light which was using an "off the shelf device" for greater purposes. The City of Austin still hasn't installed a bicycle signal stencil like we have in Portland (map at the link), but they have several projects that have made cycling better in the City. My main takeaways from this visit were not signal related. Although, City employees have done some very interesting work in deploying an ap developed by Kimley Horn that can use data from mobile phones within the traffic signal system. The data transmitted from the phone is a Vehicle to Infrastructure (V2I) prototype that may be used for detection of people on bicycles (although it could be used by people in cars as well). The most important reason to attend the conference is to put faces with the names and exchange ideas. Nathan Wilkes shares knowledge with attendees. Ideas that are "traded" City to City save the public money. Take for instance the Urban Bikeway Design Guide. The City of Portland doesn't need to reinvent the wheel and develop a "Portland specific Guide", we can use NACTO's version. If we need more information, we can also call our colleagues as opposed to using consultants for every detail. (No offense to my consultant friends). 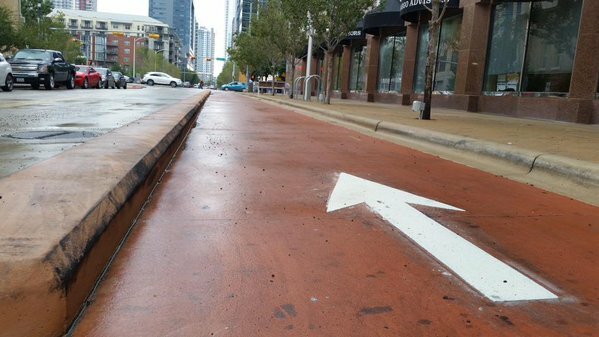 The example of curb types for protected bike lanes is one such example. I was impressed with the City of Austin's abilities to implement curbs on some on-street sections where it would have been easier to leave separation and transition to either shared space or a more traditional bicycle lane. 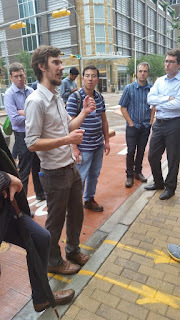 As Nathan Wilkes, our tour guide said, "the City did a lot of outreach in order to insure that the protected lane was preserved for the entire length of the street". The Oregonian had a nice write up on the 100th birthday of traffic signals in Portland. The column concluded with an email I sent awhile back thinking to the future of transportation. "Curious about what Portland's traffic and its growing signal system might look like 100 years from now, I recently asked Peter Koonce, the city's chief traffic signal engineer, to take us into the future. Here's how he responded in an email:"
I am not a futurist (yes, that's a title), but I played one when writing a Strategic Highway Research Program Project proposal back in my consulting days. There are so many scenarios, it is really hard to imagine and state what's actually possible. So, in order to talk around the question, it is best to describe various possible scenarios. There's what I would call the pessimistic view that suggests that we'll have the same constraints in the future because the public sector will be financially constrained and afraid to innovate and adopt new technologies. There's an optimistic perspective that offers that technology will change everything and what we have today will be obsolete. Driverless cars and "Connected Vehicle" concepts will be the new normal. Technology could eliminate the need for much of the travel that we have to make today including the typical work commute.Amazon.com is a good example of the impact of technology on shopping trips, video conferencing for business should continue to evolve and become more useful, and the population will change albeit slowly as we age more gracefully (if that trend continues). At the end of the day, the cost of energy (think Peak Oil and climate change) will likely play a large role in this and that's hard to pin down since you're asking a transportation professional, so that will be an influence. I asked our host Andre Botermans in Houten about their safety record. 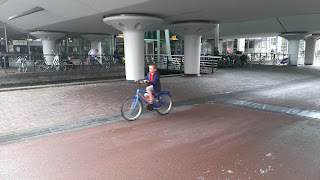 He answered promptly "Safety is no issue in Houten". "If we're talking about fatalities, we had one (1) fatal of someone on a bicycle in 20 years. A car was involved of course. There are car fatalities that have occurred on the ring road." He went on to say that the safety on the bike paths has been increased by removing obstacles. They eliminated 150 bollards where cars were not wanted and it was possible for them to turn, but along the way they have found that the car drivers know not to be on the red asphalt, so these bollards and barriers were unnecessary and proved to be a problem for the youngest and oldest people on bikes. There are low pedestrian crash rates and no fatalities in the last 20 years because the entire town is a maximum 30 km/hr speed limit (once you leave the ring road which is 70 km/hr). The City has no connector-distributor roads (collectors in the U.S.) other than the ring road because the street network offers a clear definition between that auto specific facility and the community residential streets. People walking and cycling do not have to mix with freight trucks. The City planners put the working areas outside the ring road. All of the places where trucks may conflict there are separated bicycling facilities. Grade separation may be necessary at times to create the safer conditions (shown below). The class discussion mentioned as much. One of the groups met with a woman at a park and she said that when her kids left Houten, she had to train them how to ride in a more complicated cycling environment. That sounds a bit extreme, but perhaps supported by Mark Wagenbuur's point that people take some of this as obvious in Holland, but it's very deliberate design that makes this happen.